It's 06:32 in Williams, USA right now. 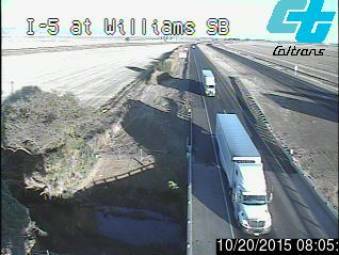 Williams (SB) A view of the current traffic situation. Linda, California: South of Feather River Boulevard, 32.1 miles away. Davis, California: Chiles Road, 47.5 miles away. Rio Linda, California: Elkhorn, 49.4 miles away. West Sacramento, California: Harbor Boulevard, 51.8 miles away. North Highlands, California: Watt Avenue, 52.9 miles away. Sacramento, California: Sacramento Skycam, 53.6 miles away. Sacramento, California: Mack Road, 53.6 miles away. Sacramento, California: Fulton Avenue, 53.6 miles away.